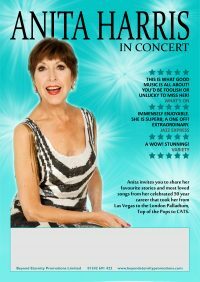 Anita Harris has had a breathtaking career spanning over fifty years. She has been a film star, television star, graced the top of the pop charts, become a pantomime legend as Peter Pan, starred in Cats in the West End and featured in 7 Royal Command Performances. She has never stopped performing and has worked alongside legendary names in the world of entertainment such as Harry Secombe, Phil Silvers, Morecambe and Wise, Tommy Cooper, magician David Nixon and Clive Dunn. Join her and her pianist Peter Gill in an intimate evening as she sings her favourite songs and regales you with stories from her fascinating life.